Beautiful drive north today - 500 miles north. This time (this is the tenth trip to Moab with one or more boats in the past 15 years) I actually stopped at Cow Springs to take a picture of the remains of the Standard Oil station. Each time I expect it will be gone, but it's still there - and not much worse than the first time I saw it. I was sure surprised to see a billboard advertising the Amigo Cafe in Kayenta. Claiming "world famous" which raises an eyebrow but they did have a new sign out front. We've stopped there many times, but this time it was too early to think about a Navajo taco, so I just kept moving. I didn't stop in Monument Valley, either. Someday I want to spend some time here, but this wasn't the time. Driving solo, I just kept moving. I really don't understand why Moab does get more respect. It's a fun town located in beautiful red rock country. Think Sedona without the yuppie bling, more outdoors oriented, and lots more (miles more) red rock. But then, we've never spent time in Moab other than as a base for Green River trips. First stop, as always, was at GearHeads. In addition to having a wonderful store with gear for all sorts of outdoor sports, they also have a water filtration system and provide free water to fill your containers. Since the Green River is extremely muddy, it's much easier to haul water - a gallon for each day. Home for the night is the Red Rock Lodge. I described it years ago as "very rustic" but walking distance to town. It's now years older and even more rustic but this year they've added free wi-fi, a benefit close to a blogger's heart! Tomorrow morning we'll be lined up at Tex's Riverways for our shuttle to Ruby Ranch. 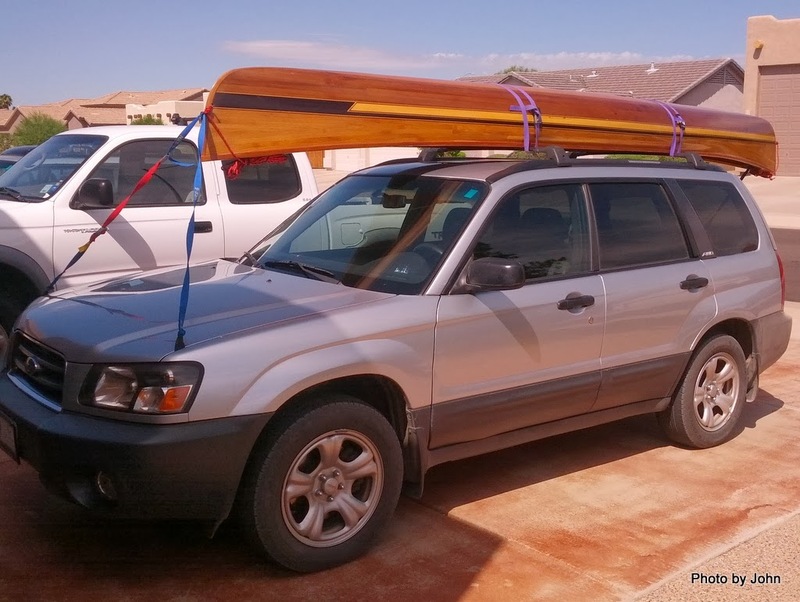 making off with BJ's car loaded with my solo canoe - destination Moab, Utah. This year I'll be doing 97 miles of the Green River from Ruby Ranch to the confluence with the Colorado River with a small group of friends while BJ stays home, waiting her trip in a couple weeks. Don't anticipate any updates until Saturday, October 5th or there abouts. and a minor surgery two weeks ago that resulted in this latest set of stitches, it looks like we have him all closed up. There are some issues that are likely permanent, but the incision is healed for which we are very thankful. Today was the day to get the stitches out. The shirt is gone, and he's happy to be chasing the ground squirrel in the wood pile. He has a speed bump because the skin behind the incision doesn't slide like it should, but it doesn't seem to bother him. We're just glad to have our buddy enjoying life with us. I hope I don't jinx it by noting that the weather was cooler this morning. No rain, just cooler. It might have been down to 75 this morning. It was nice to see some clouds but they didn't impact the long shadows for my daily walk around the neighborhood. The Mexican Red Bird of Paradise are out in all their glory. Some places the bushes are getting big enough to squeeze the sidewalk. The Bouganvilla looks good as well. It's a great time of year with all the color. At the house, BJ has been caught up in packing for her river trip even though she doesn't leave until I get back. It's always nice to look forward to river trips. On a different note, my Canon SX260 that went on the Alaska trip with us is officially dead, one week after the end of the warranty. Actually, it still takes good pictures - you just can't see enough in the LCD to tell if you have the picture framed right. I'm back to my used-to-be waterproof Olympus Stylus850. It doesn't focus as well and only has a 3x zoom but it works. I'd inspected and packed the wheel bearings before the Alaska trip, but with over 11,400 more miles on the trailer I figured I would do it again. A quick visual inspection showed significant pitting on an outer cone. I was surprised that I hadn't detected additional heat buildup in the hub when I checked at stops. As near as I can tell, the wheel bearings were original equipment. This time, I decided to spend the dollars to install US built Timken bearings. The bearing packaging even includes holographic labels to combat clones. The trick was to get the inside races out of the wheel hubs. The wheel hub casting didn't have enough relief to be able to get a drift onto the backside of the cup. After trying other tricks including dry ice, I resorted to the 70 year old arc welder - it gets used at least once each year. A couple blobs on each race gave something to set the drift against to drive them out. The new races were driven in, the cones packed, new inner seals installed, and everything went back together neatly. The brakes were adjusted and the new wheel & tires mounted. We're ready to roll again. One of the several factors getting back to Arizona when we did was that BJ and I had a sorta complex pair of river trips scheduled for early October and although we were both trip leaders, we hadn't done any planning while we were enjoying the Alaska trip. We've done the trip many times before so planning was less of a concern, but this time we were doing separate trips targeting the same jet boat date. When Turk was scheduled for a third surgery, I read the handwriting on the wall and cancelled my trip so that I could be home to take care of Turk while BJ introduced her two annual hiking odyssey girlfriends to our favorite river. I was bummed, but it was the right thing to do. Shortly after I shared that I was cancelling my trip, a friend called and asked me to join her trip. We've done a lot of trips with Helen including multiple versions of her Friends of Helen trip in January. This year she was planning a 10 day Green River trip doing both Labyrinth and Stillwater Canyons a couple weeks ahead of the dates BJ had selected so now I get to go and will be back in time for dog sitting. The way the logistics work out, I get to use my solo canoe for the first time in 18 months! So now, with less than two weeks to launch, I've developed a menu and I'm starting to do some trial packing. Meanwhile, Turk seems to be healing very well! In early April I wrote a post about trying to find a matching tire for a fresh spare preceding our Alaska trip. This post assumes you've already read the previous post. We headed northbound with 7,790 miles on the Maxxis tires and a brand new Kumho of the same size and ratings for a spare. On the way home, while in Stewart, BC I noticed that my curb side Maxxis, with 16,007 miles on it, had apparently blown a ply and was now out of round. I noted the problem because of increased tread wear in a couple spots on the tire that happened to end up in a position where I could see it. No telling how long I'd run the tire that way. I'd been watching some outer shoulder wear that suggested I'd need to find someone to align the axle at some point, but tread wear had been good to that point. I put on the Kumho spare and pulled the Maxxis with the idea that I'd talk to my Discount Tire dealer when I got home. Note that while both Maxxis failed, neither failed catastrophically which is a huge improvement on some of the ST stories I've heard. I told the Nampa Discount Tire manager I wanted to install either replacement Maxxis or Kumho 857 tires. He couldn't get the Maxxis and the Kumho was on national backorder. I asked about 15" tires with similar outside diameter and ratings and he found Continental Vanco tires in a 215/70R15 size that had nearly matching specs, but it was going to take a week to get them. His only timely solution was to install Goodyear HMG2020 tires that are custom built for U-Haul. They are the same 205/75-14 size, nearly an inch smaller diameter, bias ply, D rated with a lower 2,039 pound / 63 mph rating. They are built in Canada. The sidewall states they are property of U-Haul, not for resale but they appear to be widely available. We called my local Discount Tire manager who agreed to buy them back from me when I got home as long as I ordered the Continentals through him! I've always been picky about my tire diameter because I only had 1/2" clearance between the rear canoe rack and the top of the garage door. By going to the 15" Continental tire I can maintain the clearance but have more options for emergency replacement tires if needed. This tire is engineered in Germany and built in the Czech Republic. It carries a 109 'S' rating which gives it 2,271 pounds and a speed rating in excess of 100 mph. just as soon as I get the bearings changed since at least one is starting to fail. It's been a bit surprising to see how much has changed around here in the four plus months that we were gone. The Mexican lime tree, although it was pruned before we left, decided to send suckers to the sky. 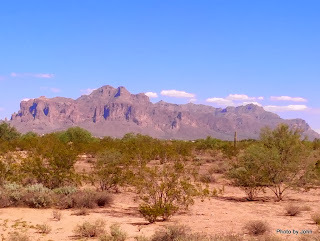 What hasn't changed is the monsoon storms and the Arizona heat! Our daughter and her fiance did a wonderful job keeping the landscaping in check. I was really surprised to see bumper crops on the lemon, Mexican lime, and orange trees. Still green of course, but looking really good. Usually one or two of the trees decide to bear but it looks like it will be all three this year. As we drove around town, we were surprised at the number of new businesses that have just opened or that are advertising openings in the near future. You leave town for a while and the world changes. Turk's situation continues changing. He's scheduled for his third surgery tomorrow although we're hoping that this one will not be as involved as the first two. Still trying to get his incision healed.